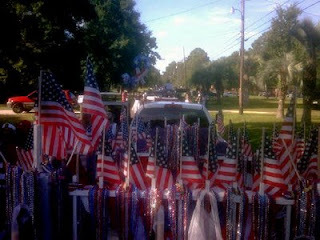 Today we were in the parade at Lynn Haven. It was great except for the heat. By early morning it was already in the 90's I believe and next time I will wear shoes, not sandals. I think my feet are sunburned. Anyway, we had to be up early and I wasn't feeling well last night, which continued into today. So I came home and had a really bad headache and a tummy ache so that means I missed the party they had after the parade. I had really intended on going too. Anyway, here's a picture I took with my cell from the float before we started.